I used the BB markers to color in the images. I sponged the yo yo yellow around to soften the white. Did you ever think you would here of yoyo yellow softening anything? I used the corner rounder punch to create the scallops. The image and sentiment are popped up on dimensionals. I am not sure I like the bow, but it seemed so plain without it. I am trying to challenge myself to use the Bold Bright Colors more often. They are the last colors that I grab for. Yummy!!! This looks BEAUTIFUL!!! Thanks for participating, Corie. You did a marvelous job!!! 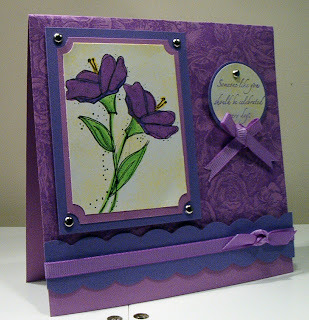 I love the colors of the card, and the flower stamp is done so beautifuly. This is gorgeous - I love purple! And funny what you said about yoyo yellow :-) but it looks great!! OMG the colors are fabulous together! Great work! This card is beautiful! I still love IFB, and wish it wasn't retiring!